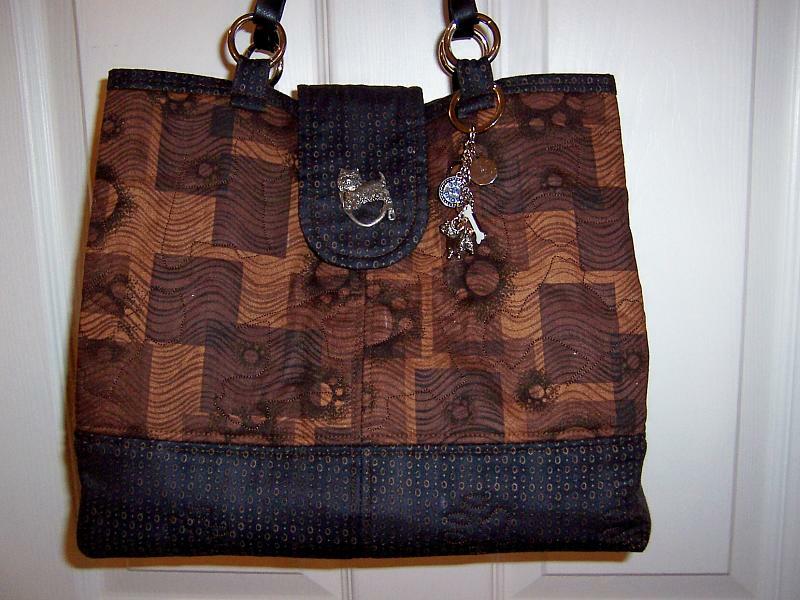 The "bling" on the front handle of the bag is a keychain with doggie charms that was gifted to me by a friend. The Westie pin on the flap closure is actually intended to park sun- or eyeglasses. Sometimes I wear it on a lapel when I need to switch between glasses while shopping; I think it will do the same job attached to my Miranda. 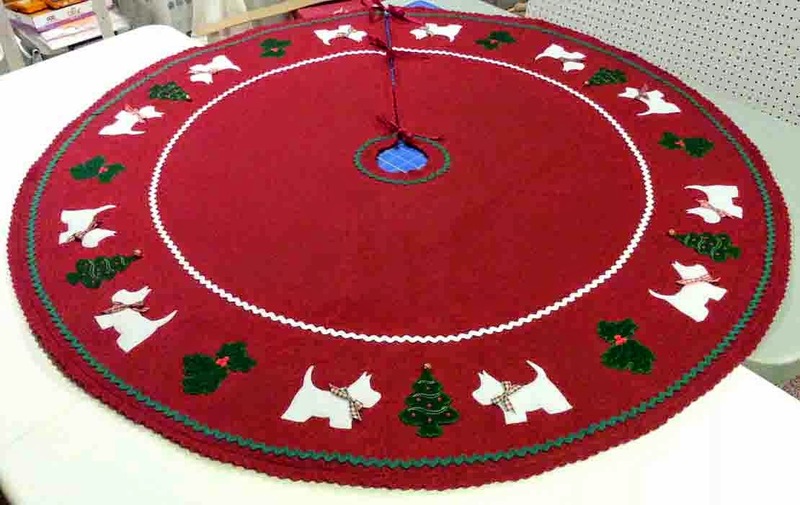 I've had this pattern since late last autumn and I always knew I wanted to use the Westie faces fabric in some fashion, but the project needed to "simmer" in my mind for a while before I was ready to get started. For months I collected all the components I'd need to make this bag -- the interfacing, the handles, the fabrics and the hardware. Everything finally seemed to come together after I found the brown paw print and other fabrics at the NJ Quiltfest and the black Keepsake Calico accent fabric at JoAnn Fabrics in March. Aren't Westies supposed to be white? Shouldn't the bag be Westie white? Well -- maybe, but if I did that, eventually the bag would probably look dirty and gray. So the colors I have chosen are chocolate brown and black and they are a perfect match to the beautiful brown eyes and little black noses of my two Westie girls, Keli & Penny. 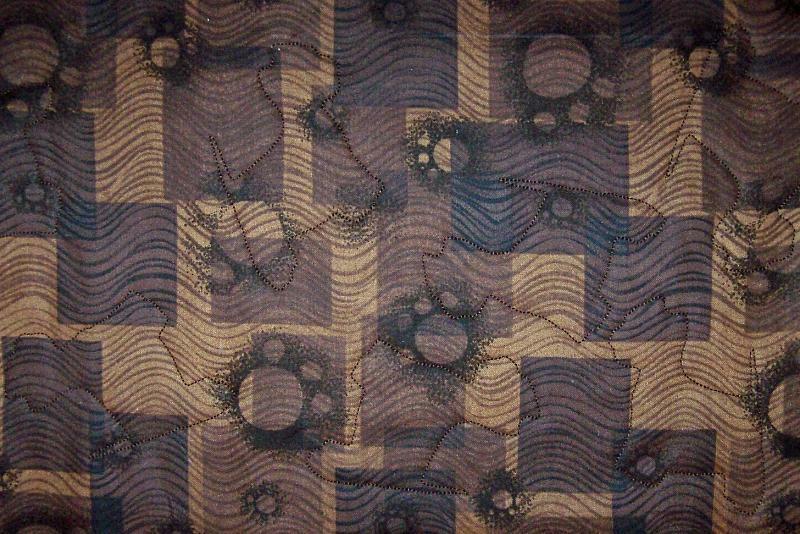 From a distance, I thought this brown paw print fabric was just a design of squares and circles (or bubbles); when I looked at it closely, I realized the circles were actually paw prints. That's the kind of subtle, slightly sophisticated whimsy I had in mind. Anyway -- I started cutting out the fabrics for Miranda over a month ago, but I was stumped when it came to quilting the pieces (see my previous post here). This was before I signed up for the Lazy Girl Designs Yahoo Group, where I've been lurking for about a month now. That's where I found out that a lot of the Mirandas are made with fusible fleece/batting and so didn't actually need a lot of quilting. But I still wanted some Westies on the outside of my bag . . . I experimented with free motion quilting . . . and did not enjoy it. I think I had my machine set up correctly, but unless I was playing around with squiggles, I didn't like the results on my sample. And I could not make a Westie design the way I envisioned it. So the idea of free motion was scrapped. Next, I thought maybe I could draw the Westie designs randomly on the fabric and just sew along the outlines of each. But that would probably take me a week and the samples I tried using that technique were not very good either. Finally, I decided to digitize a Westie embroidery design and let the machine embroider the quilted Westies for me. It's been almost a year since I've had the upgraded 4D Professional embroidery software and all I wanted was a simple outline design, so this should have been a snap. That *is* one of the reasons I wanted the embroidery design software in the first place -- so I could create Westie embroideries! Can you see the tumbling Westies? Success at last! After the Westie quilting was complete, I decided to digitize paw prints and machine embroider the quilting on the black bottom section. Once that step was completed, I was finally ready to start sewing! It took me about 4 nights to digitize, embroider and cut out the pieces for the cover of the bag. That's not because it was difficult -- I just didn't have more than an hour or two free at a time to work on it. The bag went together very quickly and logically -- the directions are very clear and thorough. It only took me a few hours to stitch all the pieces together. I decided to use the black purchased handles because the brown set was not quite the right color. I used the 3" squares cut from the bottom of the bag lining to make the carrier loops that attach the purchased handles to the bag. I *really* needed a new bag -- it's been a year since I made my Sewphisticated Chelsea backpack (named because of the machine embroidered design from Loralie Designs Sewphisticates 2 collection) and it is starting to show some wear. (See my previous post about my Chelsea here.) The pocket flap has loosened and the loop that holds the straps at the top is starting to fade. And, although this is a really fun and useful bag for shopping at the quilt shows and fabric shops, it is just a little bit too whimsical for some other occasions. So it is not being retired, just getting a rest and retrofit. oh I love IT!!! Great Job, love your Blog also. 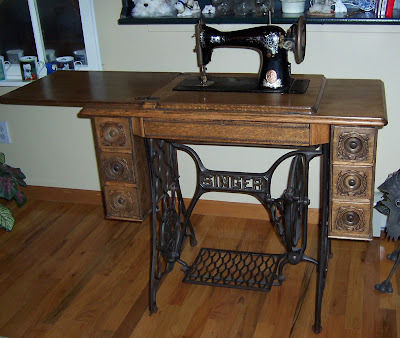 Love your Miranda, really cute and lots of good detail, I also machine embroider and have embroidered the handles like in your Chelsea, but hadn't thought about embroidering for the quilting, lots off food for thought. I've bookmarked your page for future blogs.